Democrat Campa-Najjar responds to being called a "security risk." Democrat Ammar Campa-Najjar, who's running to unseat Republican Rep. Duncan Hunter in California, responded Wednesday to a Hunter ad calling him a "security risk" because of his Palestinian family connections. Campa-Najjar was on ABC Live's "The Briefing Room" Wednesday to speak with Political Director Rick Klein and Deputy Political Director MaryAlice Parks. He criticized the ad, saying he is not a threat to national security, but he is a threat to Republicans. Hunter is fighting to keep his job after being indicted over the summer for charges related to misuse of campaign funds. 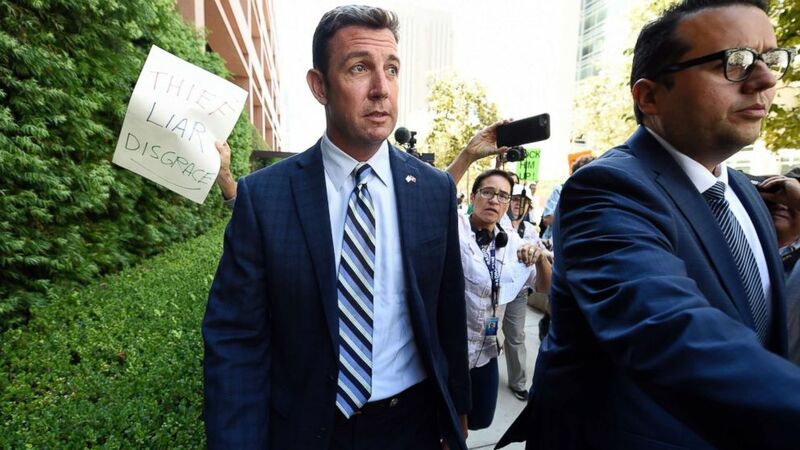 (Denis Poroy/AP, FILE) Rep. Duncan Hunter, center, leaves an arraignment hearing, Aug. 23, 2018, in San Diego. Hunter and his wife Margaret pleaded not guilty Thursday to charges they illegally used his campaign account for personal expenses. Campa-Najjar’s grandfather, who died 16 years before he was born, was involved in the 1972 terror plot at the Munich Olympics. Hunter has tried to capitalize on that fact, saying that his family makes him a threat to the nation. Campa-Najjar criticized Hunter and said he personally tries to draw on the friendly messages sent in the past Republicans like McCain, who shut down similar comments being made toward his presidential opponent Barack Obama. California’s conservative, San Diego area district has been represented by Hunter since 2013 when he assumed the office from his father. The former Obama staffer and Labor Department employee said California’s 50th district is ready for a change. Hunter was indicted in August for the misuse of more than a quarter of a million dollars in campaign funds, which included a vacation to Italy, dental pills and plane tickets for a pet, according to the New York Times. FiveThirtyEight still only gives the hopeful Democrat a one in seven chance of winning the seat.